What is an Escrow Account & its Types? How it Works? freelancing, automobile sales, property mortgages, cryptocurrency trading and lots of other monetary transactions. Nowadays, escrow accounts are not for large sums of money: they cover a very wide range of activities, with payments as low as $5. 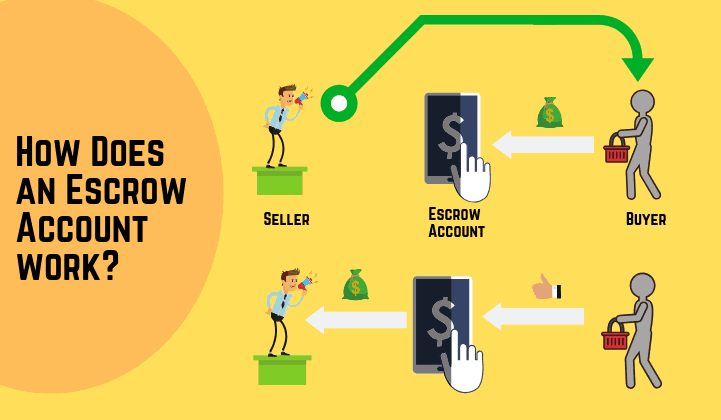 Therefore, here I explain what an escrow account is and how it works. Let us go back in time, to the 14th Century and consider you and me, are living in France. I have something to sell. You wish to buy it, from me. But we do not trust one another. Yet, we finalize an agreement. You will pay me only after I have satisfied your terms and conditions. Fair enough. We both sign a small agreement on a piece of paper or parchment. This agreement is held by a third party along with your money for my stuff. I submit proof of meeting your terms and conditions to this third party and demand payment. You are satisfied with this proof and allow the third party to pay, my money. The piece of paper on which our agreement is written is called ‘escrou,’ in French. Over the centuries, this system continues. Now it is known as escrow. Legally speaking, an escrow is defined as ‘contractual agreement’ that involves a third party to receive and pay the money on behalf of the seller and buyer. Escrow accounts of olden days were simple. In modern times, they are very complex and cover a large number of transactions. Therefore, I will discuss the various types of escrow accounts and how they work. Some of these things will definitely surprise you. Yes, Automated Teller Machines or Automated Transaction Modules, as they are known in some places, is a form of escrow account. An ATM holds money on behalf of its owner bank. When you insert an ATM card into the slot, the machine verifies whether you meet the bank’s terms and conditions. Upon getting satisfactory confirmation, the ATM will dispense cash. When you deposit cash at the ATM, it works on the same principle. The machine holds your cash on behalf of the bank. It confirms your deposit into the bank account. In this case, the bank does not actually receive the currency bills. It gets an electronic signal from the ATM and credits the money into your account. Ditto when you pay bills. The ATM is holding your money for the utilities or services provider. The ATM owner will pay the utility provider on your behalf. Here, the ATM and its owner are the escrow account for the utility provider. Your mobile and online wallet are other excellent examples of the simple escrow account. If you keep money in Amazon Pay, for example, you are using an escrow account. Amazon holds your money and deposits it at some bank. You can use this money to pay for purchases on Amazon. Usually, Amazon does not stock every single item that features on its online store. Instead, it serves as a channel between you and the seller. When you buy something, Amazon pays the merchant from your Amazon Pay account. If you are not satisfied with the stuff and return it, Amazon will get back your money from the merchant and keep it in Amazon Pay again. Mobile wallets work slightly differently as an escrow account. They hold money on your behalf. If you buy something online, the seller will send a payment request to your mobile wallet. The money will be taken from the mobile wallet after your approval. In the US and certain other countries, a mortgage is also an escrow account. While availing mortgage, the lender will set up an escrow account for you. The lender can be a bank, credit union or any other financial institution that provides a mortgage for housing and real estate. When you pay a monthly mortgage, the money goes into the lender’s escrow account. Part of it goes for repaying your mortgage and its interest. The balance is kept for paying property tax, home insurance and other legit charges that apply on the mortgage and house. Upon full repayment, the lender usually refunds your money, if any is left over after paying all taxes and other charges. You must be reading news about collectors buying a painting worth millions of Dollars at art auctions. Such news does not carry the identity of the buyer. Why? Because the art collector can be some very famous person or even a mafia boss. They do not participate in the auction physically or through a proxy. Instead, they will bid online where possible. So, how does the auction house and the buyer transact? Through an auction escrow account. Here, art collectors deposit large sums of money at a bank that has transaction links with the auction house. The bank holding the escrow account guarantees payment to the auction house, on behalf of the buyer. After successful bidding, the anonymous buyer or a curator examines the painting for authenticity and other details. Since millions of Dollars are at stake, the bank or escrow house will release the money only after the buyer verifies the painting is original. Unfortunately, scams involving fake escrow accounts are surging. Consequently, auction houses and customers are abandoning escrow accounts. Fine arts and rare collectibles brokers and auctioneers such as Sotheby’s and Christie’s hold private sales too. They inform very few and select buyers about the stuff on sale. This can include pieces of art or rare stamps, unusual pictures or antiques. Buyers use an art escrow account with the auction house or its bank to pay for the stuff. More so, if they wish to stay anonymous. Again, the buyer or a curator will verify the stuff to certify its authenticity. The auction house or arts broker gets the money after a customer is satisfied. This is possible through escrow accounts only. The bank or escrow house guarantees the payment. Till the bank or escrow house refuses payment for any reason, the item is considered as sold out. Hence, it can no longer be put up for sale. An escrow account protects buyers and sellers. The escrow account provides a payment guarantee. Are you a software developer? Or does your company wish to buy unique software? In such cases, use a software escrow account. It protects your rights as a software developer. For companies, using escrow account means having exclusive rights over the software. Now, the software works on something known as source code. As a seller, you will never give the source code to an unauthorized party. Similarly, a company will need the source code to maintain and upgrade the software. Generally, all software developers and buyers use escrow accounts. They protect both parties. The software developer gets the right price and has to meet obligations such as keeping the source code secret. The buyer gets assurances the source code will not be given to others. Hence, it gets exclusive user rights. Further, software escrow assures the buyer of getting necessary source codes even if the developer stops functioning. Nearly 53 percent of America’s workforce has freelance or part-time jobs. This trend is spreading worldwide too. Consequently, websites that provide freelance and part-time jobs or crowdsourced tasks use escrow accounts. In fact, escrow accounts are the necessity for the gig economy. As freelancer or part time worker, you would definitely want guarantees an employer will pay. The same holds true for crowdsourced tasks. Because such employers are usually at distant locations. Therefore, major websites providing freelance jobs and part-time work hold the money in escrow accounts. This means they get the money for your work from the employer. And they hold it, awaiting a nod from the employer. When an employer certifies the work meets their standards and requirement, these websites transfer the money to your bank account. This system protects you as freelancer or part time worker as well as the employer. Cash and document escrow accounts is a service usually available from large banks and financial institutions. It concerns a broad spectrum of extremely high-value transactions that can run into billions of Dollars. Commonly, cash and document escrows come into play during mergers and acquisitions of companies. Banks and financial institutions will hold cash and documents of the two transacting parties. Once a merger is approved by the government and shareholders, if any, the cash and documents exchange hands. The export-import trade also depends upon cash and document escrows. An importer is unable to lay hands on a shipment of goods unless the exporter gets payment guarantees. In such cases, the bank or financial institution gives a Letter of Credit to the exporter. This document guarantees payment from the importing firm or its bank. Judicial escrows simply mean that a court and its representative holds assets and documents of two parties. They are common in divorce proceedings. The court will appoint a third party, usually a government organization, to hold an escrow account. In such cases, assets come under the protection of the court. In divorces, the court will pay alimony, damages or other entitlements from assets held in escrow. During partnership or business disputes, a court will hold properties and other assets in escrow which will be given or divided between parties, depending upon the judgment. If you have a dispute with a landlord, the most obvious solution is withholding rent. But failing to pay rent means you can are breaching a contract, which is an offence under the law. In such cases, opt for rent escrow. Rent escrow accounts are great solution to sort out problems you may face due to the failure of a landlord to fix something or provide a service according to the lease contract. Instead of paying the rent to the landlord, the money goes into an escrow account at a court. Upon hearing both sides, the court may decide to refund your rent or pay the landlord. The court can also direct you or the landlord to take certain steps such as repairing a faulty pipe or providing a service. Keeping the money in a rent escrow account means you cannot be evicted from the place. And the landlord has a guarantee of getting the rent after resolving a problem or dispute. These are gaining rapid popularity across the world. Elderly care escrow accounts are for senior citizens who are unable to function properly due to age related problems. These problems include poor vision, inability to sign documents, memory loss and chronic illness. Usually, elderly care escrow accounts are of three types. One is from government agencies, second from relatives of the senior citizen and third, of the elderly themselves. Funds and assets of an elderly citizen with age related problems will come under the protection of a government agency and court which ensures that the needs of a senior citizen are met properly. Sometimes, caring relatives of a senior citizen with age related problems can open an escrow account with an elderly home. The elderly home provides all the needs of the senior citizen. Relatives authorize payment to the home for the care and meeting these needs. Often, senior citizens also open escrow accounts. They assign a bank or trust to care for their assets. In such cases, the escrow account ensures that an elderly does not fall victim to scams and frauds. It also protects senior citizens against exploitation for money by relatives. World Health Organization estimates, over six percent of all senior citizens worldwide are victims of elderly abuse for money. And the trend is growing. We live in a digital age. Hence, a lot of data is stored digitally. Thus, it is prone to falling in wrong hands and manipulation. Often, two companies exchange sensitive data such as information about a product, formulas, financial statements and others. Data escrow accounts protect the buyer and seller. With the data escrow account, the seller ensures that information goes to the legitimate party. And gets the money when the buyer knows the data is secret. Usually, data escrow accounts are useful during mergers and acquisitions, buying formulas or recipes for well-known brands or handing over financial records for scrutiny. As the name suggests, inheritance tax escrow accounts are opened after a person’s death. Usually, the tax authorities of a country will open an inheritance tax escrow account. A portion of assets of the deceased person is kept in this account to clear any unpaid taxes. Further, an inheritance tax escrow account also plays a key role, for surviving relatives. When a person leaves a will or legacy, the account will help all heirs to pay taxes before inheriting the property. Also, an inheritance tax escrow account is opened for deceased who leave the world intestate. Cryptocurrencies are now a popular form of investment. But you may not wish to buy and sell Bitcoin or other crypto-currencies openly for various reasons. For example, cryptocurrency investments could be taxable in your country or even illegal. In such cases, many crypto-currency investors set up escrow accounts through banks and other financial institutions. Buying and selling crypto-currencies through an escrow provides additional anonymity. Conservators is a system of the US government for minors who inherit small to large sums of money and assets from deceased parents or others. Under the system, the court nominates a conservator for the minor. The money and assets are held and administered in escrow system under America’s Uniform Transfers to Minors Act (UTMA) and Uniform Gift to Minors Act (UGMA). UTMA and UGMA accounts give money and assets to the person on attaining legal adult age. Escrow accounts are very safe. They involve a third party that usually has a strong financial background and conforms to various laws. An experienced manager will look after an escrow account. Unfortunately, there are several scams involving fake escrow accounts that continue to dupe people worldwide. Therefore, deal with only legitimate and well known agencies when buying or selling something through escrow account transactions. PayPal also has a system that allows people to open escrow accounts for paying for various products and services.